My name is Natalie Ratkovski. I'm an artist, illustrator, designer and non-fiction writer. In January 2014 I started a big book project names "An Endless Book" for artists and illustrators. What is it about? Well... There are 52 weeks in the year. Let's draw a complete illustration in every week! We’ll succeed in making of a whole book at the end of the year. Anyone can join the book project "An Endless Book" and make one’s own book. One week - one illustration! You are free in the choosing of page size and techniques. Illustrations can be made by computer, photographs, watercolors, crayons, markers, paper or clay, or be any kind of collage or scrapbook pages. The important condition is: the illustration on the previous page has to follow into the next page illustration without the visible seams or rough blends. For this purpose it is better to make a notebook folded accordion-pleat style (called leporello). Your leporello (20-52 pages) will be a large panoramic illustration at the end of the year. Term & Conditions: Do you use my project? Do you like my project? Please write my name an the link to this page! In 2014 I was publishing collective posts once a week on Thursdays on my blog conjure.livejournal.com Now you can plan your own book by yourself, follow me on Instagram and post your works on Instagram with the tag #anendlessbook Enjoy! See my Endless Books here: World under wather? (not published) and Adventures of Tami and Sami (published by Mann, Ivanov and Ferber). 01. Who can participate? Is any registration required? 03. How often should I show my works? 04. 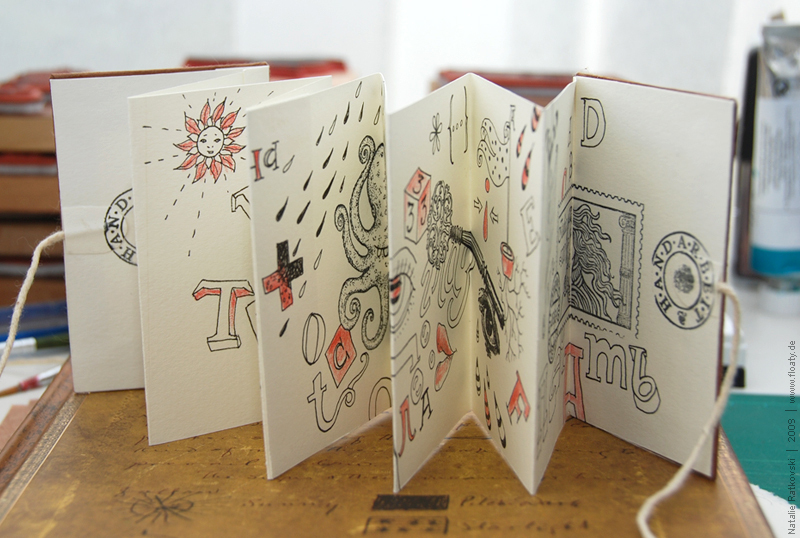 How to choose a theme for your handmade book or to elaborate the end-to-end concept? 05. How to make a notebook for the project, what format and kind of paper? 06. Which technique could I use for the picture? Think first what you would like to draw, photograph or do handicraft for whole year. Plants? Animals? Your own life? Daily breakfast - lunch - dinner? Or maybe you would like to tell the complete story like keeping a diary of feelings or discoveries? Or maybe you want to devote all the year to making self-portraits or portraits of beloved people? In any case, try to make the concept for all the year with a plenty of space for your imagination. It will be better to have a notebook folded into an accordion-pleat style. It’s necessary to attach a tough check cover with ties at the both sides. So, there is no fear that your thick album swell even more at end of the year. You have a few options. 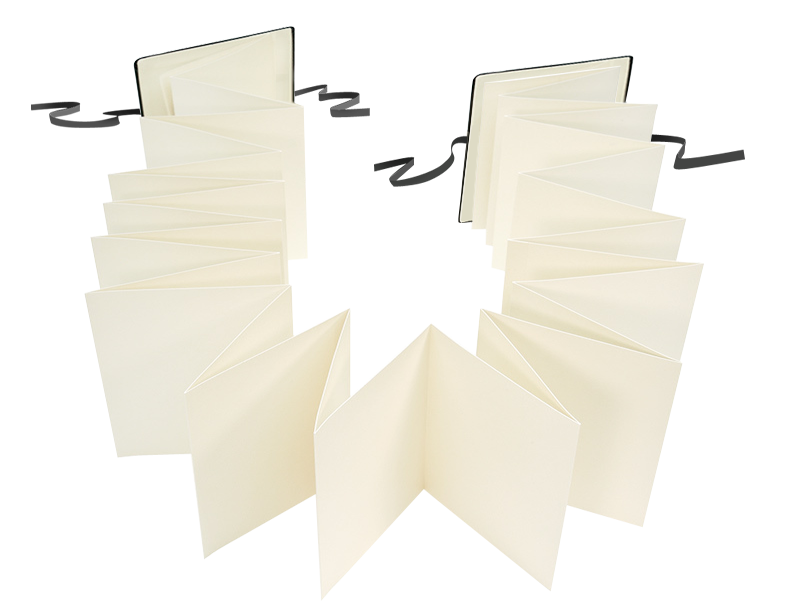 At the beginning you can make a book-accordion (leporello) with 52 sheets and cover on sides. Or you can prepare 52 sheets of the same size and just glue every week a new worksheet. In that case, you always can cut out the wrong page and glue the new one. A cover can be made at the end of the year. Book format is completely at your discretion. If you decide that you’re able to fulfill a page of a postcard size weekly, then your book will be about the A6. If you want to swing then your book could be A3 size. Your illustrations could be vertical or horizontal - it’s you business. The main thing is the desire to create! Choice of the kind of paper for your notebook is completely dependent on technique. If you use acrylic or watercolor, it would be better to take dense small-grained watercolor paper (starting with 165g/m2). If you want to work in collage technique, it’s better not to use heavy paper because collages can be very large. If you like using of photograph and making your book in Photoshop, it’s better to print it on photo paper. More information about paper choice and quality you can find here (sorry, in Russian). By the way, if your book will be made with embroidery pattern or drawing on canvas, feel free to roll it. Then you can well do without leporello. There are no principal technique restrictions for illustrations in the project “An Endless Book”. Use one you like to or you've always wanted to learn, but placed on a shelf for a long time. Work with the computer, paint with acrylic, watercolor, markers and pencils, make a huge scrapbook or collage, engage to linocut or embroidery. The main thing is you want to do it and like to do it. 07. How to create illustrations that will blend seamlessly from page to page? Rely on your imagination! A binding of illustrations is easier than it seems. You can show a part of an object on the current page and continue it on the next one. It’s possible to use any repetitive coupling elements. For example if you make a book about the Tsar Ivan Vasilyevich’s adventures, his beard on one page may turn into a river, a tree or a couch blanket on the other page. In any case, keep in mind: the participation in this project is you chance to hone both a skill in pictorial technique and a development of your imagination. Or you can just to continue your illustration on the next sheet of paper. Copyright Natalie Ratkovski 2013-2018, English translators Olga Sabo, Natalie Ratkovski, Dimitri Ratkovski.